Neither Marxism-Leninism (at present Marxism-Leninism-Mao Tse-tung Thought) the scientific theoretical basis of carrying class struggle of proletariat nor political party of proletariat to carry class struggle is present in his poetry. 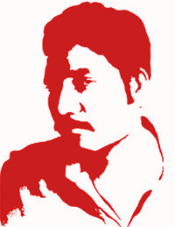 Sukanta’s poetry did not reflect the revolutionary practice of armed and other struggles led by party to establish people’s democratic dictatorship. These are the limitations of Sukanta. This is why Sukanta is acceptable to bourgeoisie, even the big bourgeoisie.